What is the role of irrigation in Southern Amazonia’s crop production? Our recent publication in Agricultural and Forest Meteorology describes the implications of irrigation in the region following field measurements of evapotranspiration obtained by eddy covariance. This text was published in Science Trends. The Amazon biome plays a key role in the world’s carbon and water cycles. Together, regional terrestrial and aquatic ecosystems link these cycles to constitute one of the world’s greatest biodiversity hotspots which has been the focus of research, socio-economic development, and conservation efforts. For over 30 years, agricultural production in the Amazon has expanded through deforestation activity, first with the introduction of pasture for cattle ranching, followed by an important soybean boom which has slowly made its way into the biome from the South. Brazilian Federal and state laws and regulations, as well as private initiatives to curb deforestation, have all contributed to an overall drop in deforestation rates in the Amazon biome . This drop has led to additional concerns of the integrity of adjacent biomes such as the Cerrado (savanna) which have also experienced deforestation activity for agriculture and currently have fewer restrictions on deforestation. Transitioning from an agricultural system based on the expansion of cropland or pasture to a system based on the intensification of agriculture on existing area is a challenge that Lathuillière et al. have set to better understand for the region. Following 17 months of field measurements at Capuaba farm, in the heart of Mato Grosso’s soybean region (municipality of Lucas do Rio Verde), Lathuillière et al. used eddy covariance to directly measure the amount of water used for rain-fed and irrigated systems (as evapotranspiration). 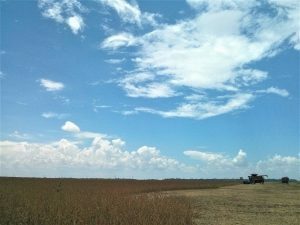 Current agricultural output in Mato Grosso is almost entirely based on rain-fed systems, in which farmers plant soybean at the beginning of the wet season (October-November), and plant maize immediately after the soybean harvest (January-February) to take advantage of the last rains. Although not widespread, the irrigated system used by the farmer represents an important option to study for future agricultural intensification. 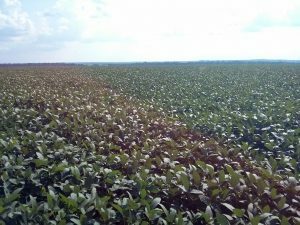 In this system, soybean is planted one month earlier (September) and irrigated until the start of the wet season. This early planting allows for an earlier harvest and planting of a second crop (e.g., maize, rice), as well as a fully irrigated dry season crop (e.g., bean). According to Lathuillière et al. , a switch in agricultural production from a rain-fed to an irrigated system has two important implications for land and water resources. First, the irrigated system represents a strategy to increase cropping frequency (or the amount of crops that can be produced per hectare in one year), and not an increase in crop yield (or the amount of crop that can be produced per hectare over once crop cycle). Secondly, the increase in cropping frequency with the fully irrigated dry season crop revealed greater annual water vapor transfer to the atmosphere (through evapotranspiration) than the rain-fed system. In fact, annual evapotranspiration from the irrigated field was similar to natural vegetation. What does this mean for production? On the one hand, increasing agricultural output by increasing deforestation to expand cropland area can potentially decrease rainfall on which cropland relies to thrive [3,4] (in addition to diminishing the carbon pool and impact biodiversity). On the other hand, irrigation expansion can potentially slowdown this process by resupplying the atmosphere with water vapor, but at the expense of the surface and groundwater resources required for production, especially in the dry season. The extent to which irrigation expansion could slow down or potentially increase regional precipitation is current unknown, and requires further research to better understand the region-wide land and water trade-offs for agricultural production. One important aspect to consider for irrigation expansion is not only the infrastructure investment required for expansion, but also the final level of irrigated land in the region that would repeat the soybean, maize (or rice), bean “triple cropping” system studied at Capuaba farm. The farmer currently irrigates 5% of his land on a 1500-hectare farm. What would be the effects on the carbon and water cycles of 5% irrigation in Southern Amazonia? These findings are described in the article entitled Rain-fed and irrigated cropland-atmosphere water fluxes and their implications for agricultural production in Southern Amazonia, recently published in the journal Agricultural and Forest Meteorology. This work was conducted by Michael J. Lathuillière, T. Andrew Black, Iain Hawthorne and Mark Johnson from the University of British Columbia, Higo J. Dalmagro from the University of Cuiabá, and Eduardo G. Couto and Paulo H.Z. Arruda from the Federal University of Mato Grosso. What could irrigated agriculture mean for Amazonia? Do decaying plants in Northern lakes lead to thin ice?